This always sounds more like an indictment than an exclamation. I don’t have a lot of time. Being frugal is easy. It’s discipline. It saves money. And my food tastes better than packaged food–because bread isn’t designed to have chemicals in it. And it doesn’t grow in an aisle at the store. This topic is near and dear to my heart, and deserves more time in print. For me, what started with “green,” progressed to “decluttering,” which has a natural evolution to “holy crap the economy stinks,” to “conserve,” to “frugal” to “obsessively frugal.” There have been some speed bumps along the way–I’ll write about those another day. Simplifying and learning “frugal” has been a catharsis. I’ll commit to breaking down my journey towards simplicity into a few posts, with one or two even having a touch of depth and serious reflection. The entire nation has suffered over the past half-dozen years. For many of us, it wasn’t anything we did directly–the housing market collapse, jobs and industries moving overseas, industries relating to those industries being impacted and fear that it could happen to any one of us. It’s been a game of dominoes America never wants to play again, with deep psychological effects. But for me, though challenging, it had an amazing outcome–simplicity. The fear of losing my house and business was sobering. I’ve lived in “situations without money,” before. I don’t like to say “poor,” because I feel that’s more of a mindset. But for anyone who has experienced the loss of a job, business, financial insecurity–it changes you permanently in ways unseen to the eye. For me, it took my interest in sustainability, cooking, green, self-sufficiency, food sourcing, and recycling, and elevated them to an obsession. I’ll admit it–such high levels of social awareness sparked by fear often become blanketed with a touch of judgementalism. I don’t shop at the regular grocery store often–I am usually at small bodegas where I’m buying ingredients in foreign languages. It’s like a culinary trip around the world for the amazingly cheap–I can go to Cambodia, Vietnam, India, Mexico, Korea, Japan, on a quarter tank of gas–how awesome for global warming! Somewhere, I know there is a polar bear who thanks me. But part of being so left-wing on this issue is that when I do go to the store, I notice the really dumb things they stock. Yesterday, I took a walk around and photographed just a few items. I am amazed they even exist, let alone rest in people’s carts. I’m stuck half-way between being ashamed at humanity for permitting these things and the desire to high-five every entrepreneur who convinced people to buy them. I might be a little jealous of their success. 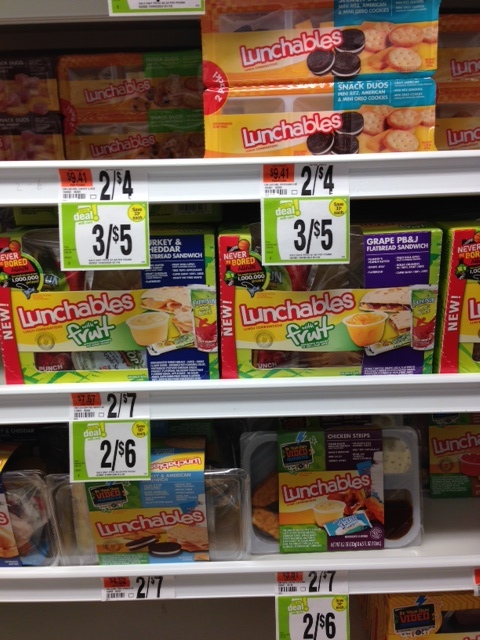 Lunchables. You’re telling me people are really too lazy to cut three slices of pepperoni and put them in reusable Tupperware next to a slice of cheese and two Ritz crackers? That they have to waste the packaging for a “lunch” that normally costs $3 and wouldn’t fill a toddler? If you pack this every day for work or school, that would be $60/month for lunch. This is the epitome of shameful. Declan asked me for one, once and I told him it was the Devil’s pepperoni. For three dollars you can have someone pre-slice your fruit, and wrap it in two layers of packaging with a hefty dose of sulfur dioxide as a preservative. 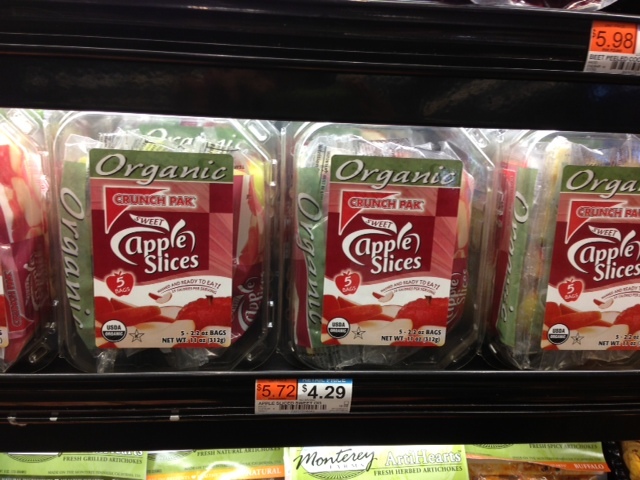 For $2.99, they will pre-slice four beets and place a smiley cartoon on top. Because seeing a smiley face always makes me want to pack beets. And the cost of six carrot sticks with a smidgen of dip–$2.50. I can buy the same carrot for a penny or two and chop it myself. Heck, I’ll do it for you for a buck. Someone even created a small plastic square holding the seeds of a pomegranate, because nature’s packaging was just not sufficient. I wonder whose job it was to take the seeds out and package them? Baby brie. For a substantial added expense, you can have mini-cheese rounds so small a mouse would call them leftovers, wrapped in a hefty dose of wax which defeats the purpose of eating them at all. Is it a candle? Is it cheese? Who knows. Best to just save the seven bucks and skip lunch. Cubed cheese. Oh, the horrors of cubed cheese and cheese sticks! Again, this goes into the “buy a big block of cheese and use the French knife God gave you” category. But for people who haven’t developed their knife skills, they can make sure to waste rolls of plastic wrapping sticks of cheese that will only piss them off later, because no one can open those things, and they are way too salty anyway. “100 Calorie” snacks. If you’re that worried about 100 calories 1. Don’t have a snack, or 2. Count the number of crackers yourself. Do you really need one of the Kiebler elves to do your first-grade math and put it in eighty layers of plastic? 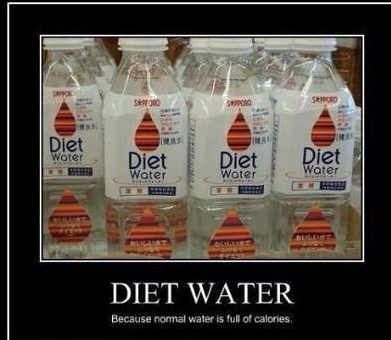 Diet water. This is something I found on Facebook. You read that correctly. Diet water. This is genius. This marketing team deserves a star on Hollywood’s Walk of Fame. Someone made people buy that “diet water.” They sold ice to an Eskimo. I want to be that person one day. That person who sells you cut up pieces of cheese for fifty bucks, a pre-sliced apple with plastic and chemicals, or a plastic tray with three pieces of pepperoni and two Ritz crackers have nothing on Diet Water Guy. I’m not trying to go all Greenpeace and PETA on you. I’m just wondering about the state of affairs in the United States where we have become so disconnected from the foods that we eat to be convinced that these things are okay. It’s affecting our health, our finances, and our national psyche. I’ve been working toward getting rid of jars and packages for a few years now. I’ve reconnected myself with lost skills–canning, freezing, drying, production gardening–I felt pretty good about learning these things. However, these were basic survival skills for our grandparents and their parents, not artisan crafts and hobbies. That all changed over the last generation or two–Generation TV Dinner. I don’t deserve a medal. I’m just getting back to doing right by my produce and grains. You know who also doesn’t deserve a medal? The dude eating pre-sliced apples. Thanks for the perspective, I really enjoyed it. So, you think there’s some conspiracy theory going on here? You are so right. Check this out: http://www.foodtank.org. It is set to launch in two days. It’s a think tank on all issues food. I was very excited to learn about it, and I think I will spend a lot of time reading this one. These ladies are brilliant! I think I just fell in love with you a little bit! I could not agree more, although I am occasionally guilty of buying tiny cheeses because they’re an outstanding way to bribe my children to do unthinkable chores, like organize the tupperware cabinet or something. One trip around the grocery store is usually all it takes to lose all faith in humanity. I can never get over the little cartons of pre-chopped onions and peppers. Are we really that busy and/or lazy, America?? And diet water? Really? I can’t even begin to fathom it. Hey, thanks:) I feel so strongly about these issues. It was when I went overseas… nothing was inefficiently wrapped, and I started to feel like such an ecocriminal. I SO agree with you – on all accounts! I too am frugal (that’s what my blog is about (: ) for many of the same reasons as you…it’s just always made sense to me! I too look into people’s carts and think – ‘what? – have you not read the ingredients and really, Peanut butter and jelly sandwiches, premade?’ thank you for such a well written post! smart woman!